This autumn the #sewfrosting challenge was taking the sewing community by storm. 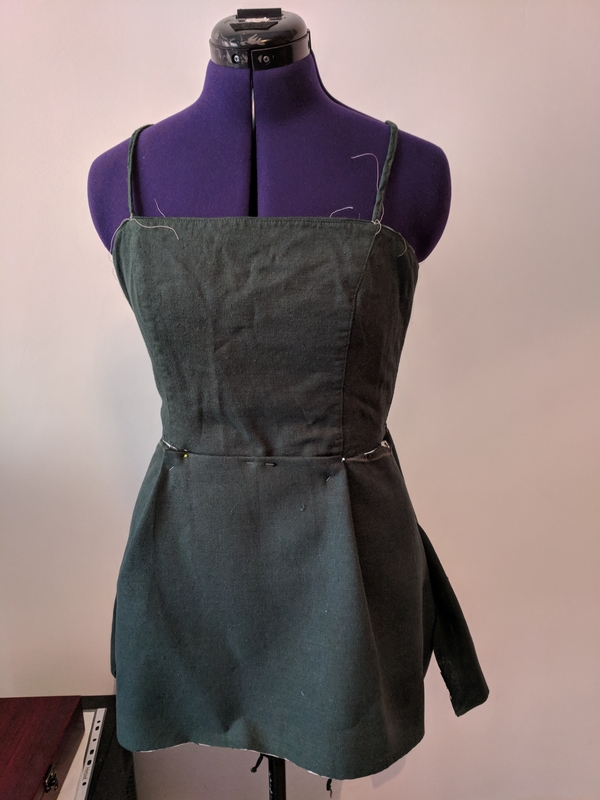 Initiated by Heather Lou from Closet Case Patterns and Kelli from True Bias, the premise of the challenge was to sew something that wasn’t “cake” (a wardrobe basic) but to sew “frosting” (something frivolous, fun). I loved the idea and immediately started scheming when the challenge was announced. 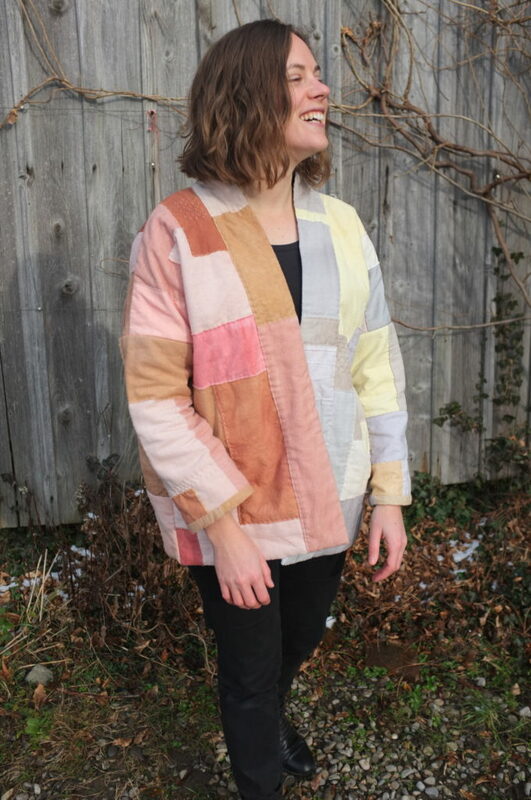 Very quickly I decided I wanted to make a quilted coat. 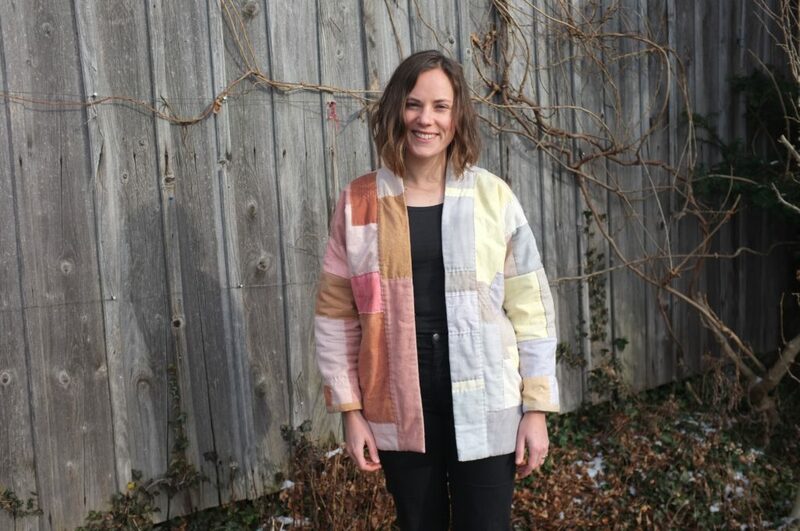 I’ve been loving Natalie Ebaugh’s and Hannah Miley’s quilted coats. 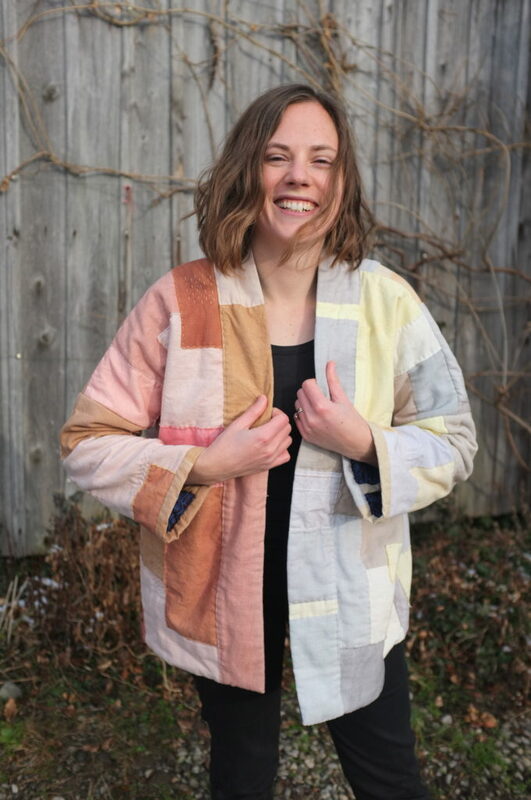 And when I saw this stunning quilt from Salt + Still it was clear that I wanted it to be a quilted coat using naturally dyed fabric. 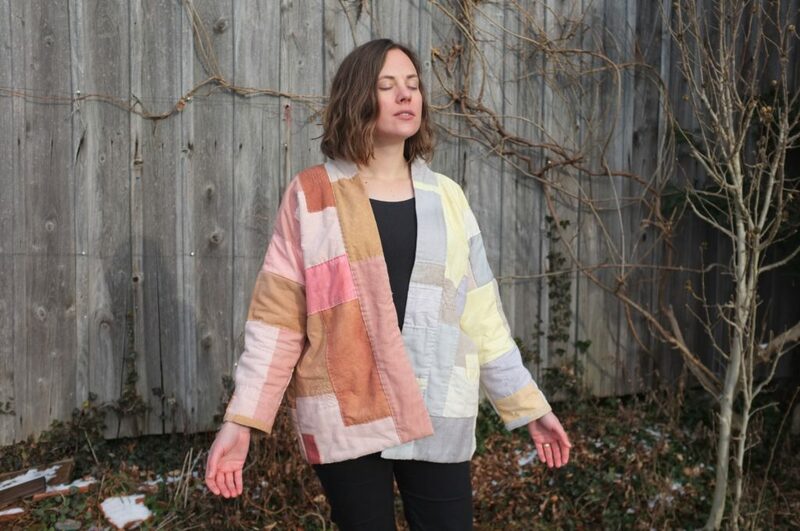 As the base pattern for the jacket I decided to use the Wiksten Haori, a pattern that I’ve been meaning to make for ages. Due to it’s simplicity and oversized nature it was perfect for the quilting that I was planning. 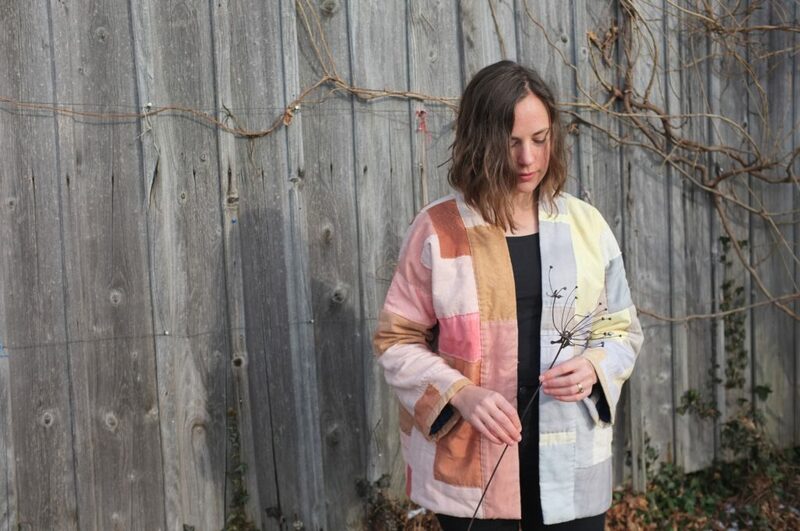 If you are wondering what an Haori is, I recommend reading Jenny’s blog post on why the name of the Wiksten Kimono was changed to Wiksten Haori. 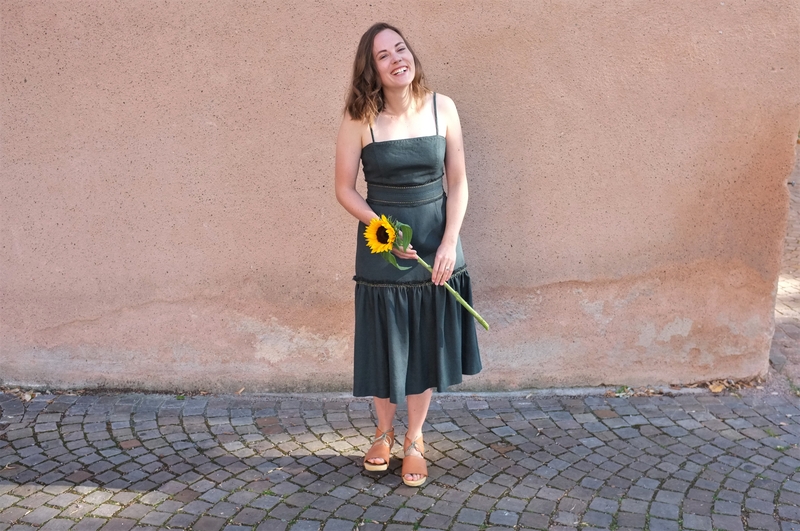 The ones that follow me on Instagram know that in November I spent a few days doing a lot of natural dyeing. I started with a cotton table cloth and a cotton/linen curtain; both old and stained / with some holes, which luckily wasn’t a problem for the project I was planning with it. Then I dyed pieces of the fabric in all the colours that I could find. I don’t have a lot of experience with natural dyeing, apart from some indigo and avocado dyeing (like my Blaire Shirt), but I was keen to experiment a little. The whole dyeing process was very intuitive. I basically just used what I could find in my parents house and garden. Once a year they have a little natural dyeing festival, so they actually have some dye plants in the garden. I even was able to save some Madder root, that my mother was getting rid of, since it is growing like weeds. If you want more details on the whole process, I have saved everything in my story highlights section on Instagram. 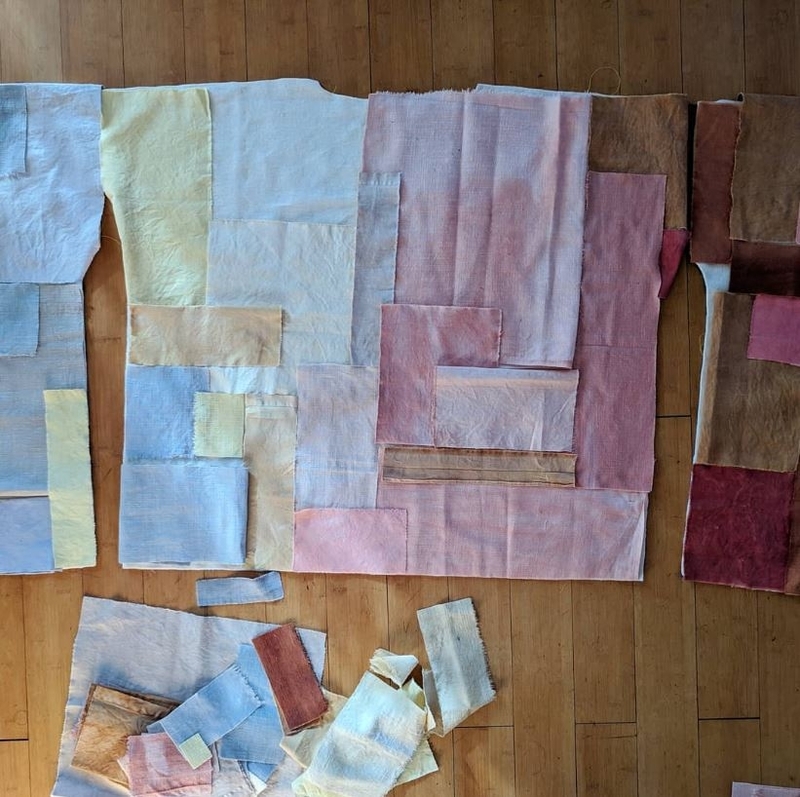 I won’t go through the whole process, but basically I used soy milk on all the fabric as a mordant and prepared the dye bath in either cold or hot water. I played around with the temperature to figure out what worked best for each colour. Except for some iron liquor (home made) on eucalyptus (from our France holiday) I didn’t use any agents to change the colour. 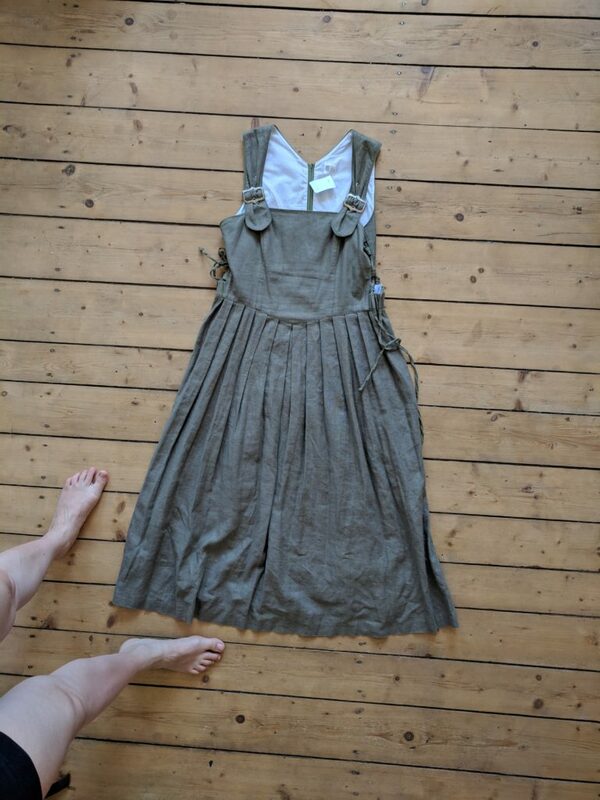 I also didn’t use any fixatives, since I found with my avocado dyed clothes that the colour keeps surprisingly well. We’ll see how well the other colours hold up. My dye charts, these are so satisfying to make. I only changed the temperature and dye intensity to achieve the different colours for each dye material. Make sure to spin out the soy milk/water mixture in the washing machine and don’t wring it out by hand, otherwise you’ll end up with uneven dye patterns. Be patient. Some colours take more time to extract than others. Avocado skins and pits for example take a while to release the colour. Start with low temperatures. Some colours (e.g. from the sunflower seeds) change colour when they come to a boil. In most cases the colours turn into a grey/brown, which you might want to avoid. 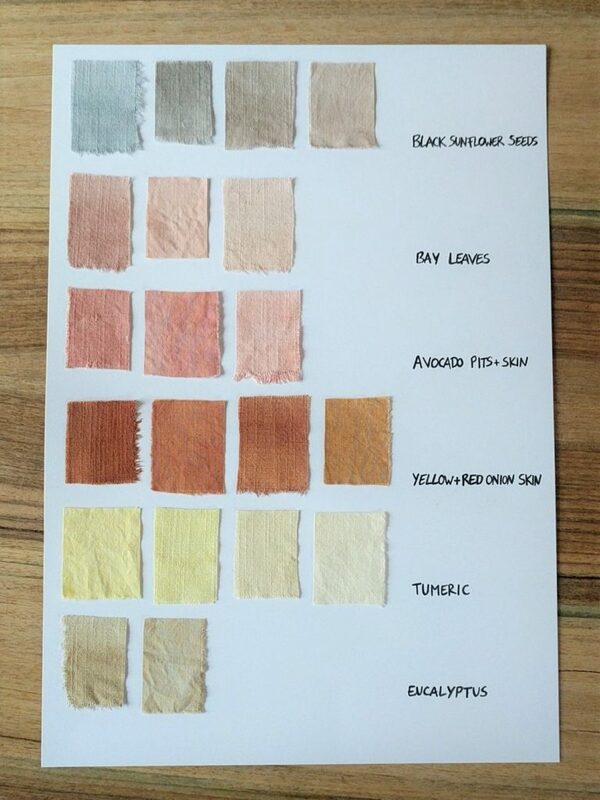 Start with little fabric swatches to get a feel for how potent the dye is. Once you know the dye is potent enough start adding bigger pieces. This obviously works best when you are doing a quilt rather than trying to dye lengths of fabric for a garment. Accept that the colours might change with exposure to sun and that the colours will fade quicker than chemically dyed fabric. My avocado dyed shirt has shifted into a slightly warmer colour over time. I love the fact that the colours change, in exchange the natural colours have a lot more depth than anything chemically dyed. Natural dye keeps very well if stored in a plastic container. I had some left-over avocado dye that I made in September, and two month later it still worked perfectly. Just make sure to strain it properly before storing, to ensure that no plant pieces are left in the liquid that could start molding. Experiment! I was in such a dyeing frenzy that I just tried random stuff that I could find. For example with the bay leaves, I didn’t know that you could dye with them, and even less that they would give a beautiful pink, such a lovely surprise! 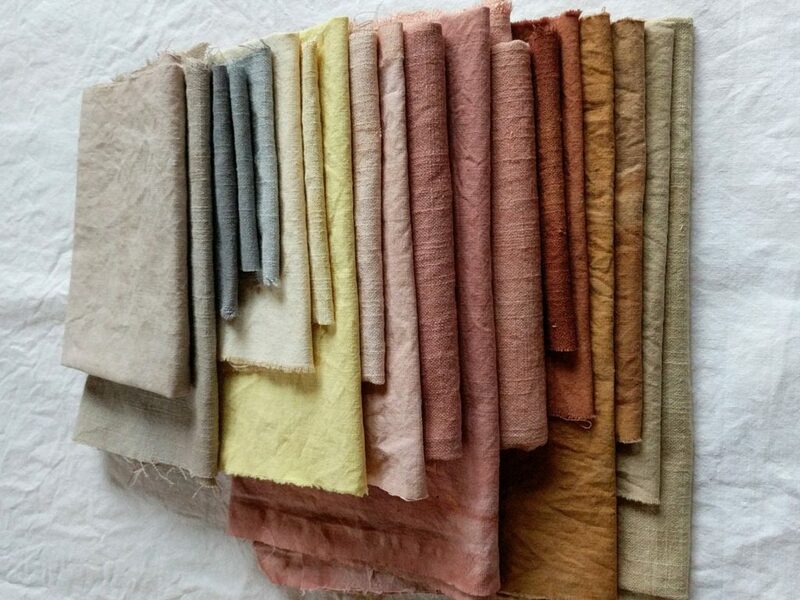 There is definitely a lot more that I can learn about natural dyeing and I can’t attest to the longevity of the colours yet, since I have only hand washed them in water so far. For this project though I’m not that concerned, since I won’t be washing it a lot. 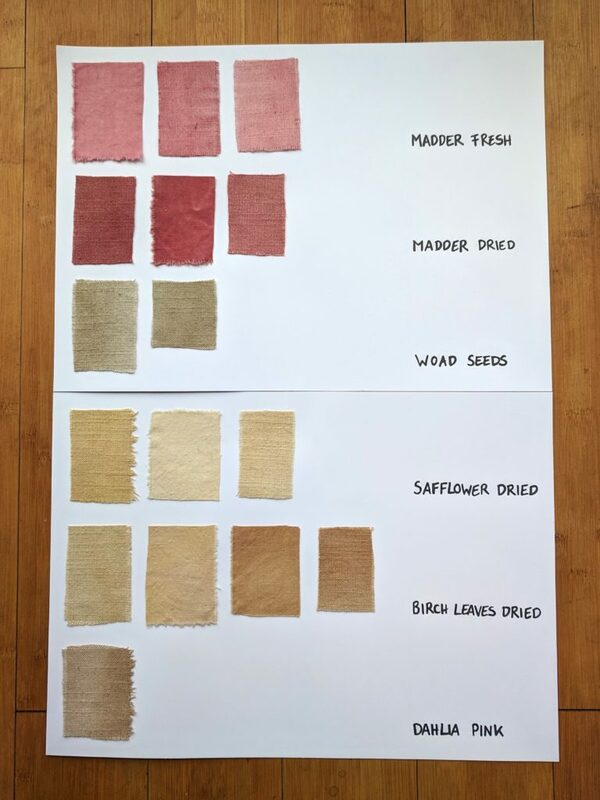 For anyone interested in getting into natural dyeing, I can highly recommend the book “The Modern Natural Dyer” by Kristine Vejar , Rebecca Desnos’ blog and the Skillshare Course “Natural Dyeing: Transform Cloth Using Food Dyes” with The Dogwood Dyer. 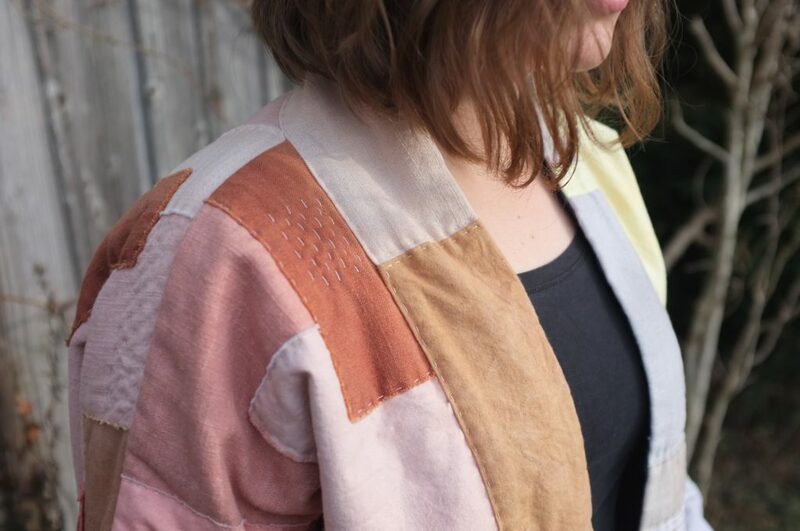 Once I had my stack of fabrics, I had to decide on how I would want to use them on the jacket. Originally I had planned to stick to a limited colour palette but then I got carried away in the dyeing process. Once I was done, I had grown attached to each colour and was unable to narrow it down. 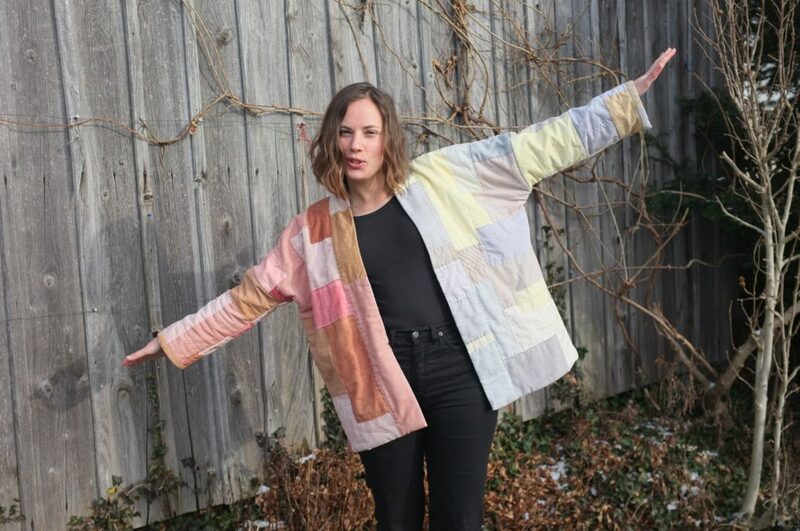 I was afraid I would end up with a crazy jacket if I used all of them, so I consulted Instagram. In the end most people supported the colourful jacket idea and I decided to go for it, it was for #sewfrosting after all! 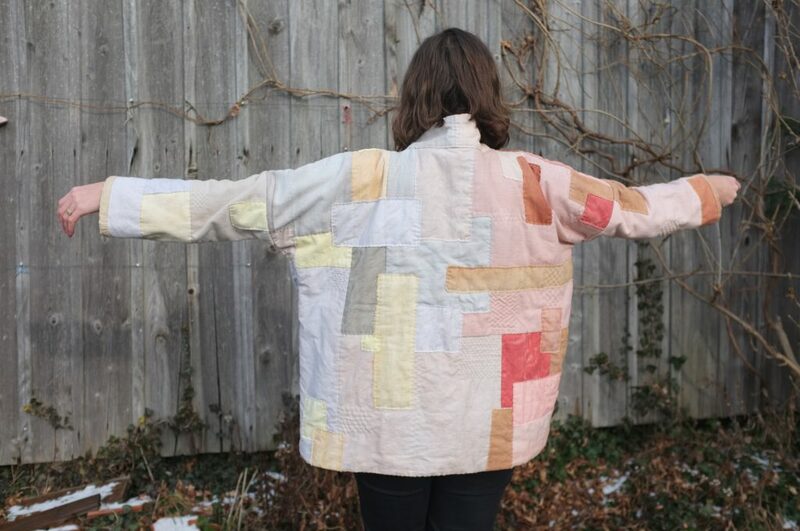 Once I had roughly decided on a design (one front in cool colours, the other in warm and the back with a colour gradient) I started piecing the quilt. To make it all manageable to quilt and to avoid wasting precious fabric I decided to assemble and quilt each jacket piece individually. For that I cut the pieces in a lining fabric (a beautiful block printed cotton that my husband brought back from India a few years back) and the cotton batting. Then I arranged the dyed fabric pieces on top to roughly work out the design. For the piecing I worked with a mixture of machine quilting (for the larger pieces) and hand stitching (for the smaller accent pieces). Already in the dyeing process I had cut all the swatches on grain, so that I decided to fringe some of the smaller pieces and applique them on top. 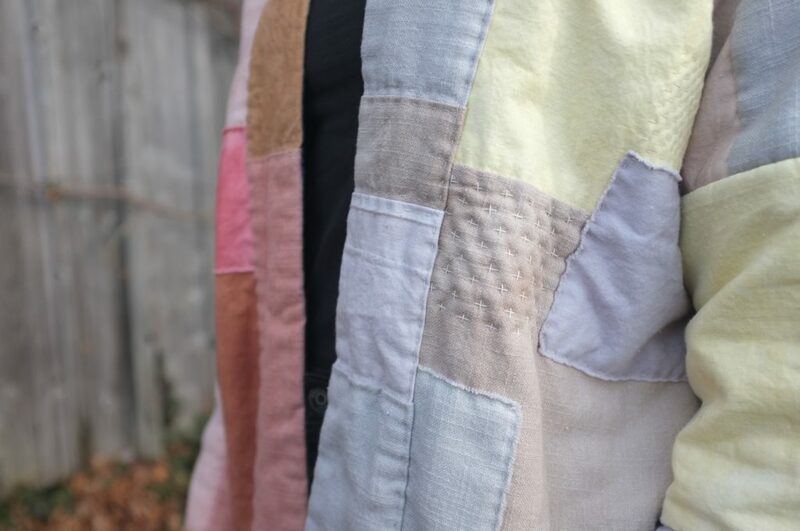 Finally I hand-quilted everything using a vintage linen thread that I had picked up at a flea market this summer. 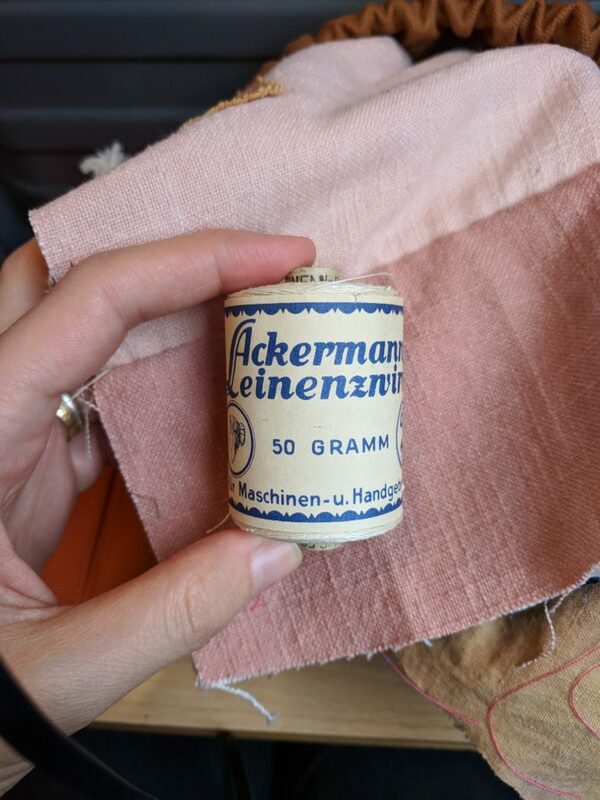 Vintage linen thread from the flea market. 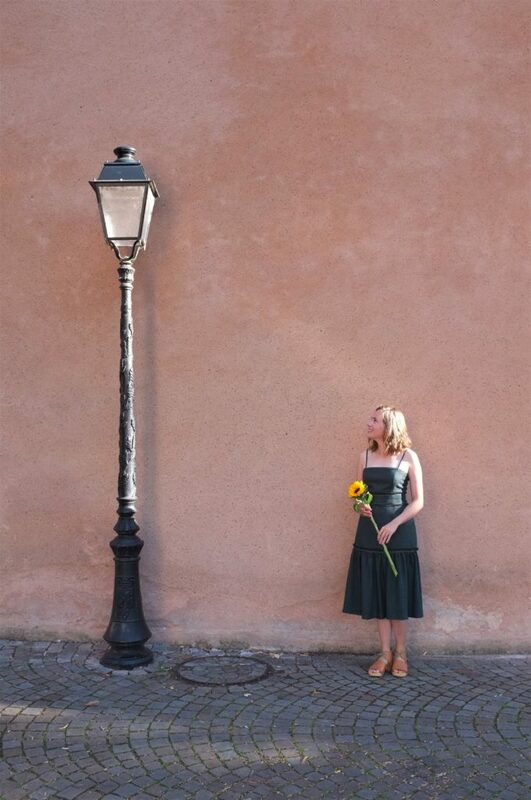 This design is to beautiful! 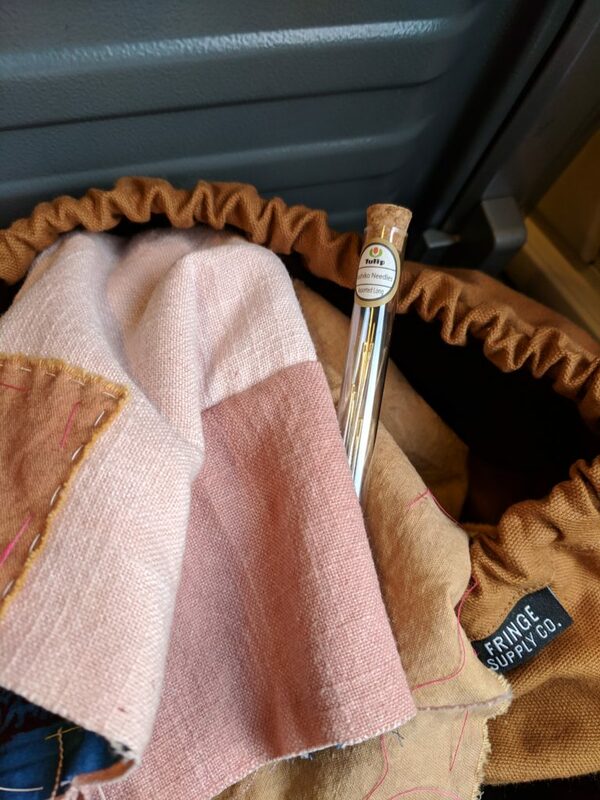 Quilting on the train with my trusty Field bag and Sashiko needles from Fringe Supply Co. 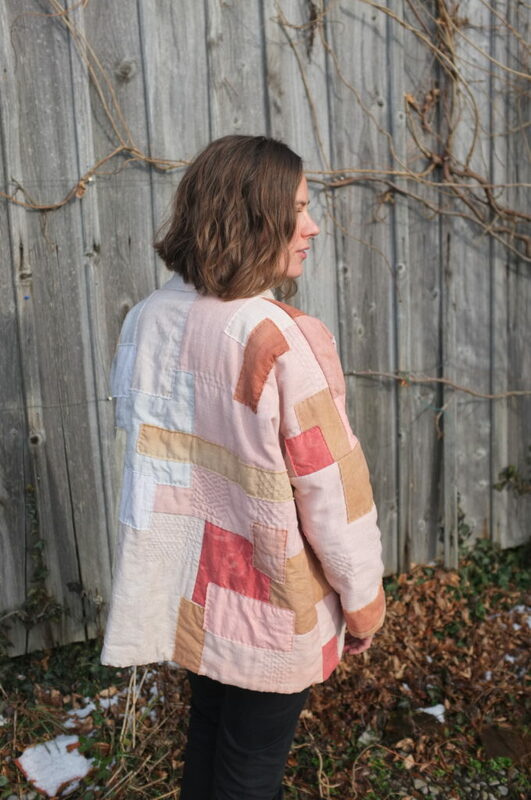 I really enjoyed the whole quilting process; especially because I was working on it while the jacket was in pieces ,which meant that it was the perfect project to work on while travelling or in front of the television. In terms of quilting pattern, I decided to follow all the joining seam lines and add additional Boro stitching in different places. The linen fabric had a few little holes, so I focused first on adding reinforcing stitches there. The rest of the quilting didn’t follow a strict pattern, my only aim was to create a balanced design overall. Once the individual pieces were quilted I assembled the Haori. First the fronts, back and the sleeves. The collar I slimmed down to remove the fold-over detail, which would have been too bulky in the quilted fabric. To finish the seams and the sleeve hems I cut strips of left over fabric and bound them by hand. For the bottom hem I decided to just fold both the outer and the inner fabric to the inside and close the seam with a blind stitch. You may notice, that I left off the big patch pockets of the original pattern. I thought they would have made the pattern too busy with all the quilting going on. 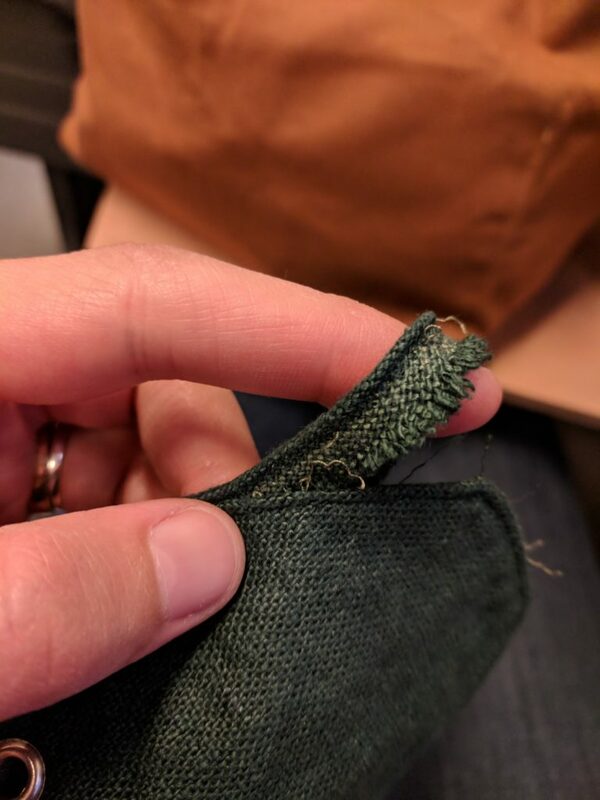 Instead I decided to add one pocket to the inside. The pattern is super straight-forward to assemble, though I had to change the order of construction quite a few times. 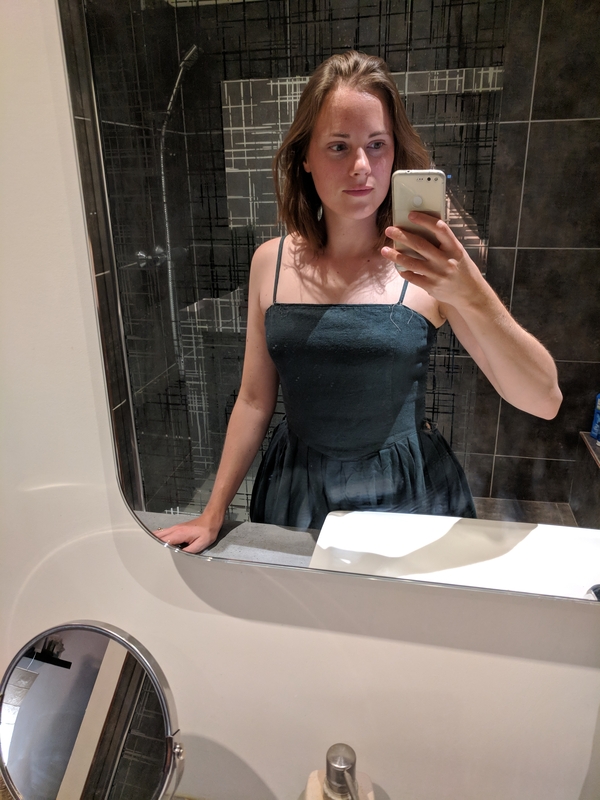 I chose to make a size M (which corresponds to my hip measurements) and I’m happy I did. While it is designed as quite an oversized jacket, I need the room to be able to move around in this thick fabric. Phew, what a long post! For everyone making it that far, congrats! 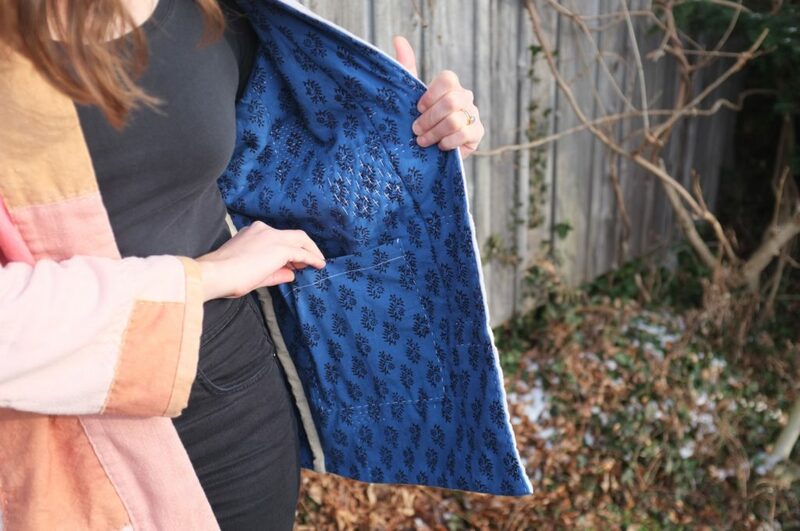 This project definitely was a labour of love, and I’m not sure if I would have ever tackled such a big and crazy project if it wasn’t for #sewfrosting. So thanks Heather Lou and Kelli for initiating such a fun challenge! 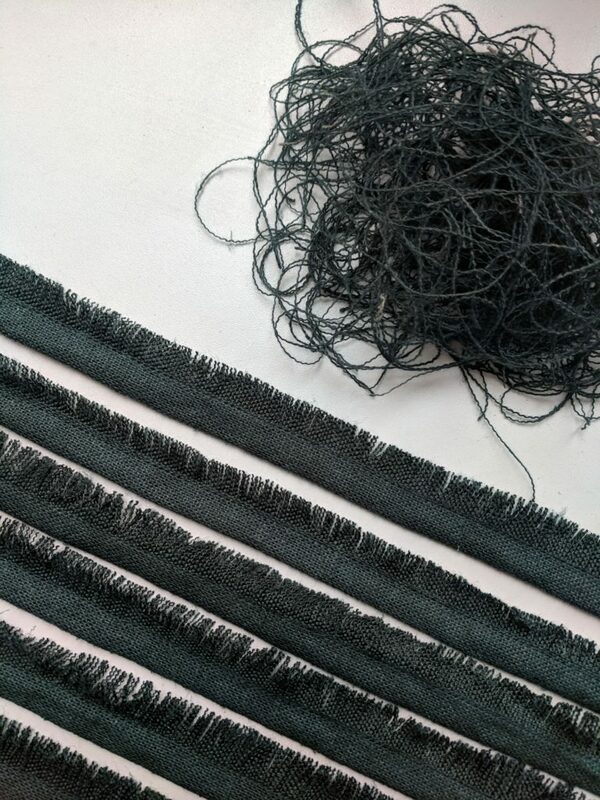 During the process it often felt more like working on a piece of art rather than sewing a garment, since it was so intuitive and the outcome so unpredictable. And I have to say, it was such a satisfying experience! I also decided to take it really slow and hand sew the majority of it. That meant my fingers had blisters at the end and I missed the deadline of the challenge by a month. But it was so worth it! The first outing for this Wiksten Haori was my uncle’s birthday last weekend. He is an artist, so it was the perfect setting and such a great conversation starter too! 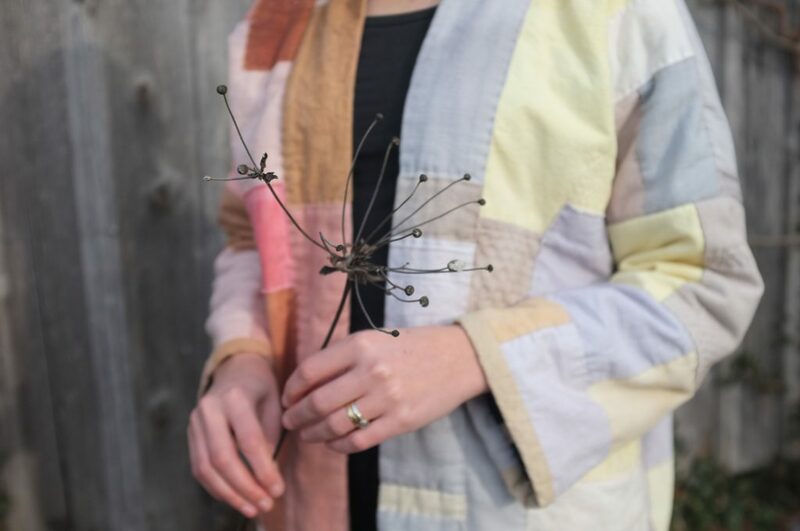 The one thing that I have taken away from this project is that I love working on projects where the fabrics and colours guide me and I don’t have to strictly follow instructions. I’ve never really identified as an artist (more as a crafter/maker) but this project really felt like art and I had so much fun! And yes, I do feel a little bit like a crazy lady in this jacket; and I don’t think I will wear it out a ton. But I love it nonetheless! So here is to the new year, to taking risks, to making art and creating something crazy once in a while. Happy 2019 everyone! Let me preface this by saying, I love a good sewing challenge! This look is definitely a departure from my usual style but I enjoyed working on this a lot. 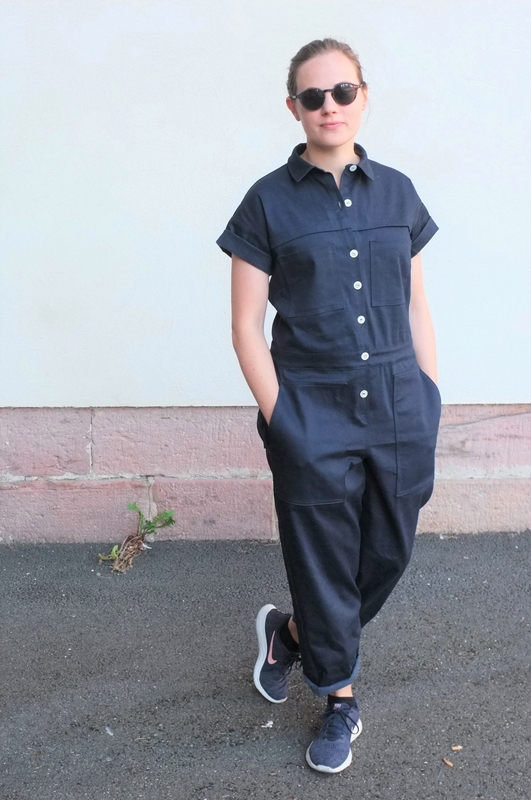 A while back, Raphaëlle from Ready to Sew contacted me to ask if I wanted to test her newest pattern, the Jean-Paul boiler suit. 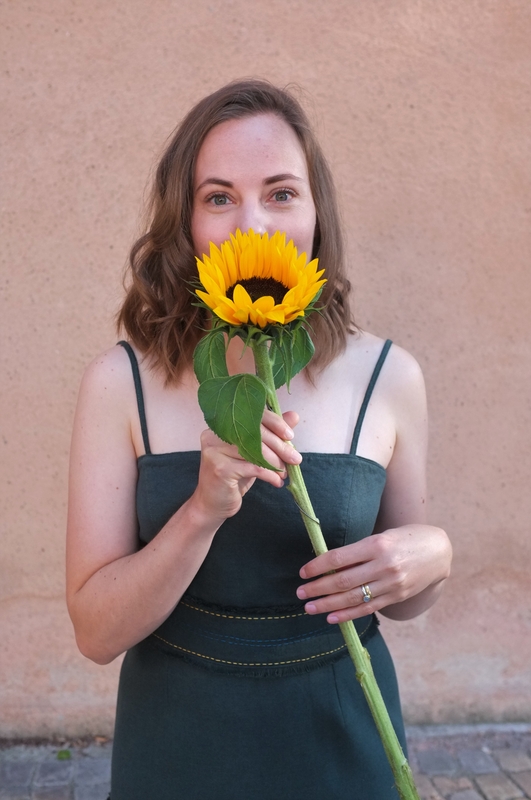 While I have never made a Ready to Sew pattern, I was very excited to try one of them as I love her style and have heard many great things about the patterns. But a boiler suit? I haven’t even really joined the jumpsuit trend and generally am more of a separates gal. However, the more I thought about it the more excited I got to try this trend. 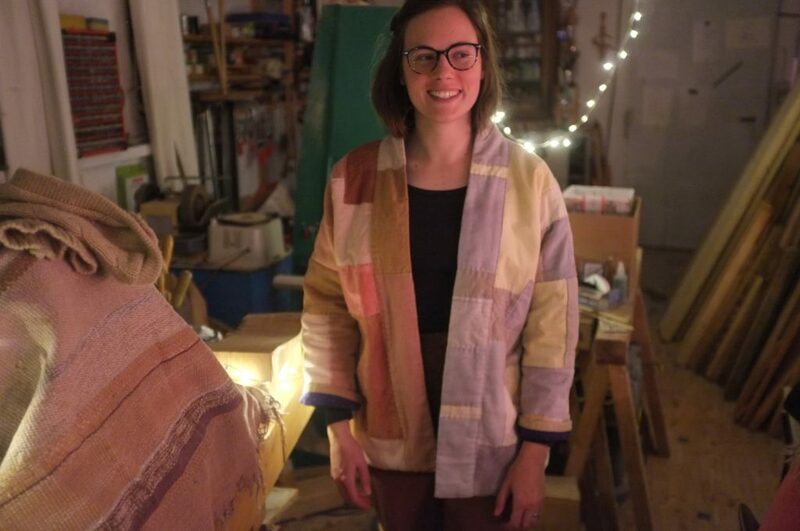 As you might know from my Tello Jacket adventures, I love making and wearing work wear. 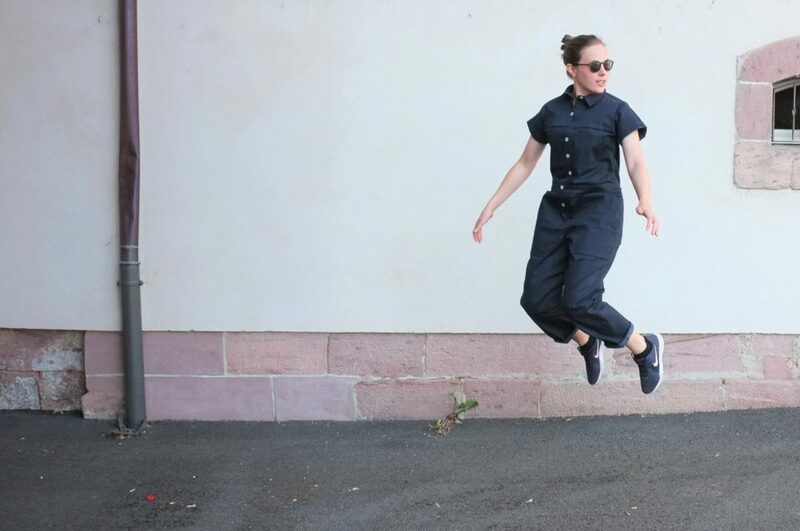 Also it seems like all the cool people on Instagram have been wearing boiler suits lately. So in the end I decided to say yes. 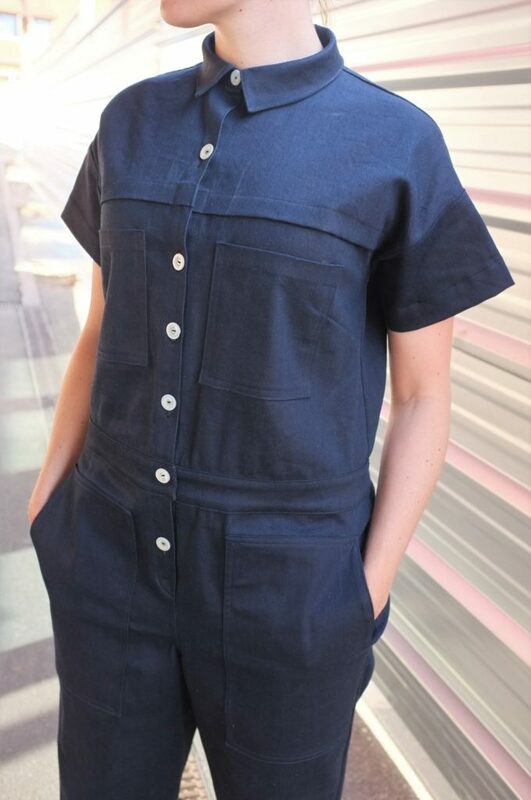 The design is really a classic boiler suit, with a collar, plenty of pockets, waistband and button placket at the front. While it is quite a complex project, the construction of this was really straight-forward. 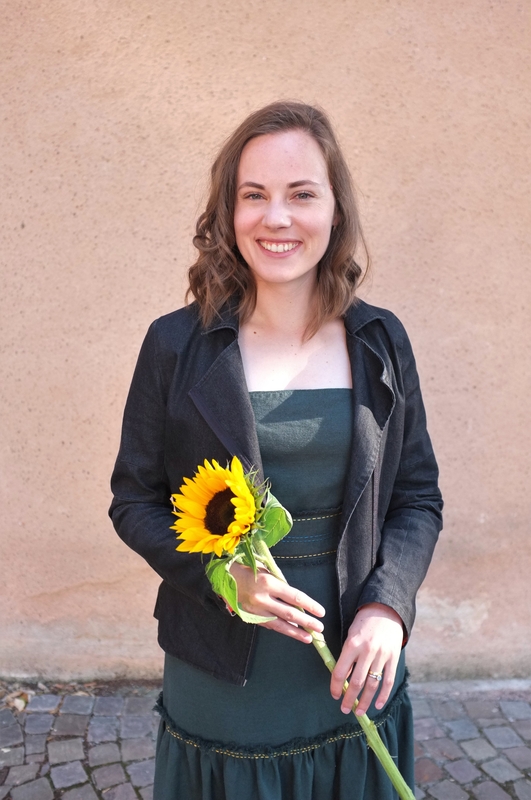 It helps that the instructions are impeccable, every step is nicely illustrated and Raphaëlle provides some additional resources for the trickier bits and fit adjustments. I didn’t need any of the additional resources but it was nice to know that I could refer to them if I got stuck. Oh, and she even provides a music playlist to go with the pattern (I’m currently listening to it, what a fun idea!). 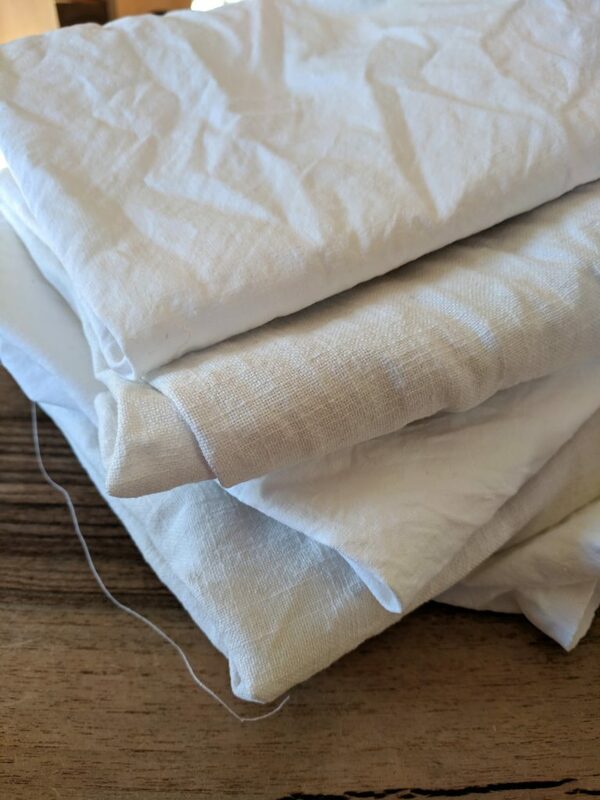 The pattern strongly recommends making a muslin first and I agree. 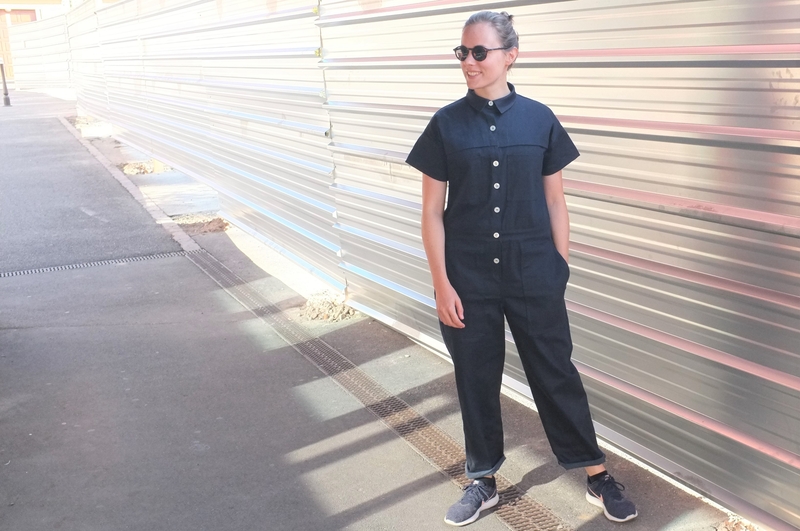 A boiler suit is just one piece, and it’s essential to be able to move around in it, so test driving it before cutting into the actual fabric is important. I followed this advice and made up a muslin in a pink cotton. I decided to go with a size 40 for the top, grading to a size 43 in the bottom (this pattern comes in half sizes, which is great). 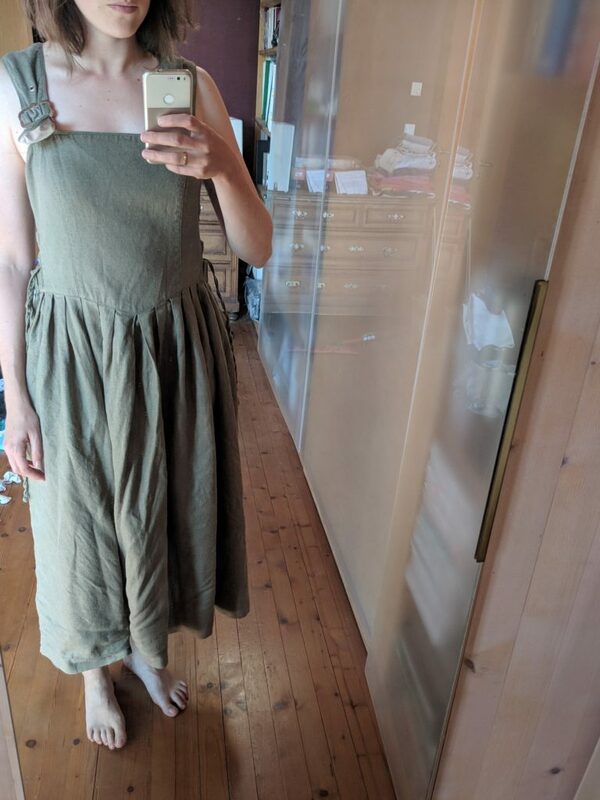 I basted everything together and then spent a whole afternoon wearing it to make sure I could move around comfortably. The crotch seemed quite low initially but the ease is needed to be able to reach overhead without getting a wedgie. 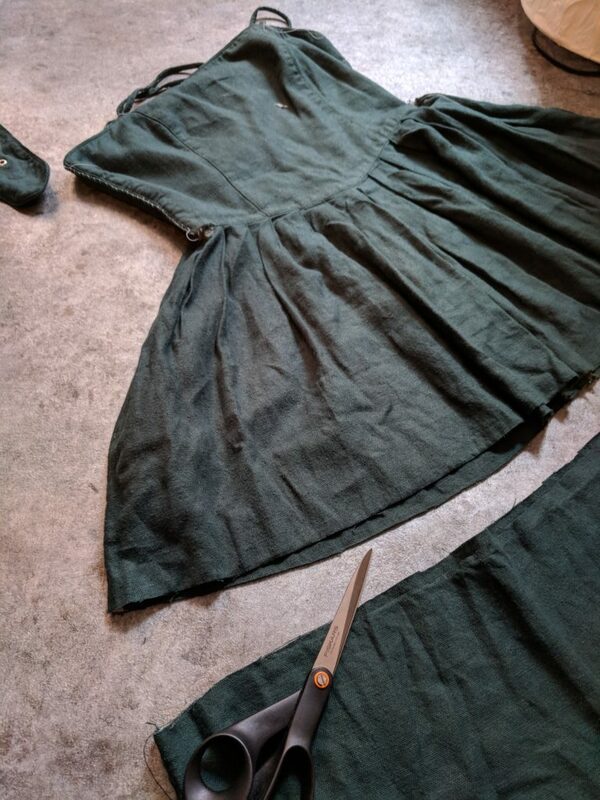 Otherwise the muslin fit quite well and in the end I made only minor fit changes. I shortened the front crotch slightly and moved the bust dart down a bit. Doesn’t this pink version look super fun? I might have to make a colourful boiler suit at some point. 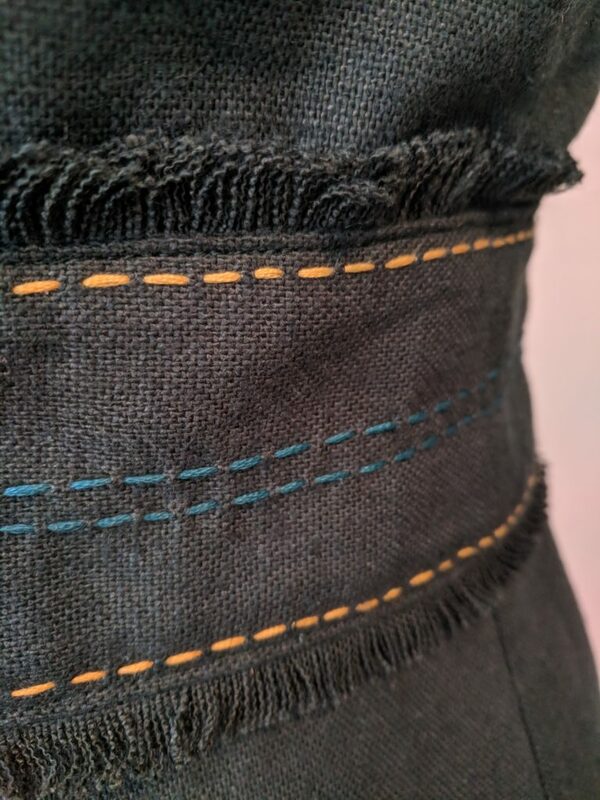 For the main piece I used a medium weight navy twill with a tiny bit of stretch (the pattern calls for non-stretch fabric). It’s the same fabric that I used for my Persephone Shorts, quite a cheap remnant that I picked up at a fabric store in Colmar. 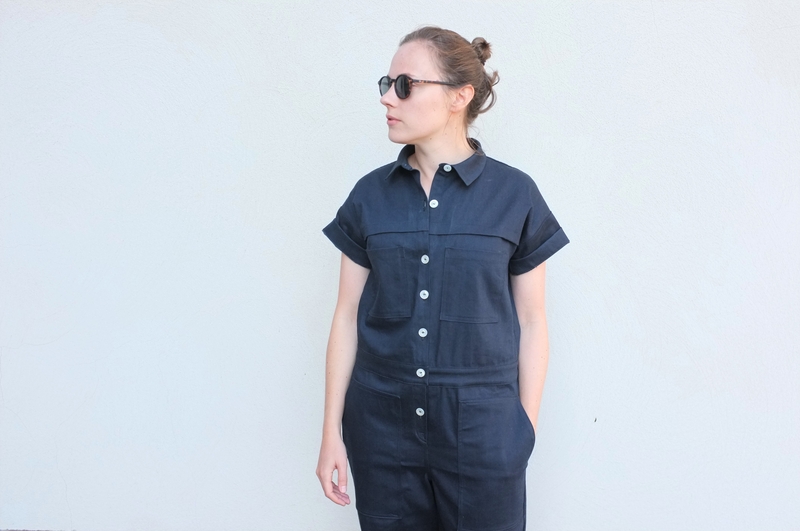 I wanted to make the boiler suit in a heavy duty fabric, for the ultimate work wear feel. It’s definitely super robust, however, for everyday wear it’s a tad heavy. The buttons are from the flea market. I’m still on the fence about the contrast colour, so maybe I’ll replace them with navy ones. 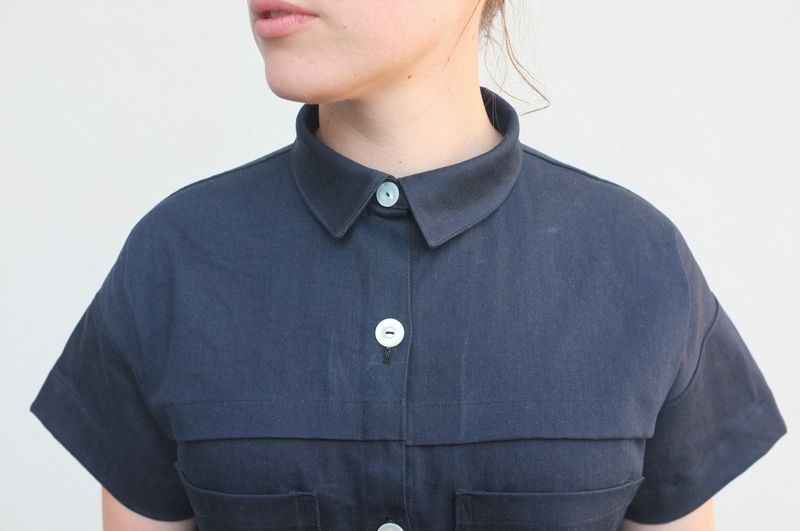 Due to a lack of fabric, I had to make the short-sleeved view but I’m intrigued to make the longer sleeve version too. 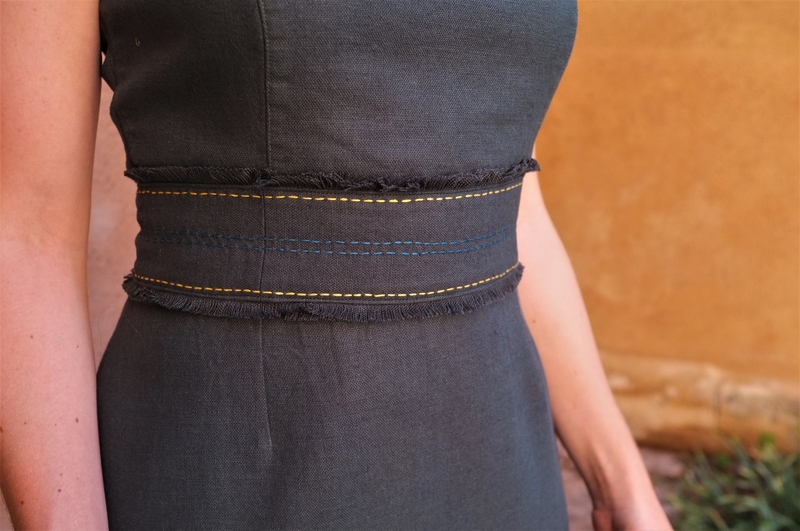 The pattern has an option for a martingale to cinch in the waist, which I decided to try out. Instead of using the pattern piece, I put the final suit on and pinched out the excess fabric to determine the length of my martingale. 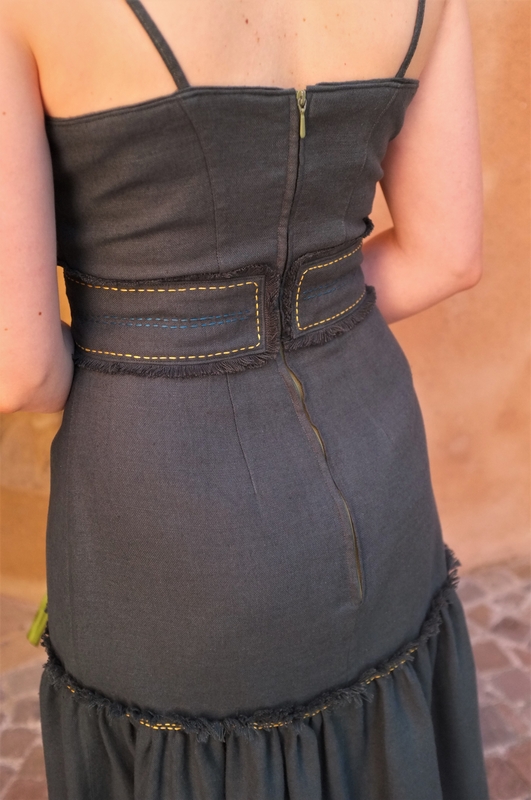 Again I’m not sure about the white buttons for this look (somehow reminds me of taillights, haha) but overall the martingale is a fun detail. 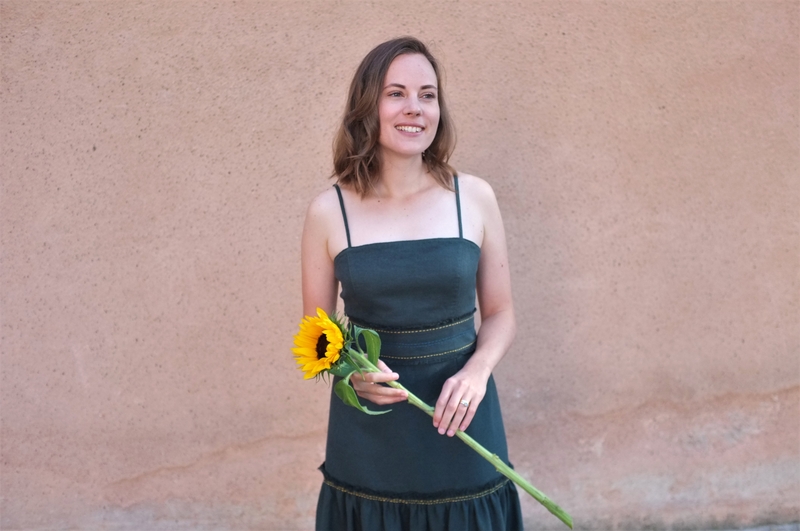 The construction was very enjoyable, I love all the tailoring details and top-stitching (I made my life easy with using the same colour thread). Overall the whole thing came together quickly. I made this when I was visiting my parents and used my old Pfaff machine. While that meant that I had to finish all the seams with a zigzag stitch I really enjoyed working on my old machine again. The fit of the final garment is good. 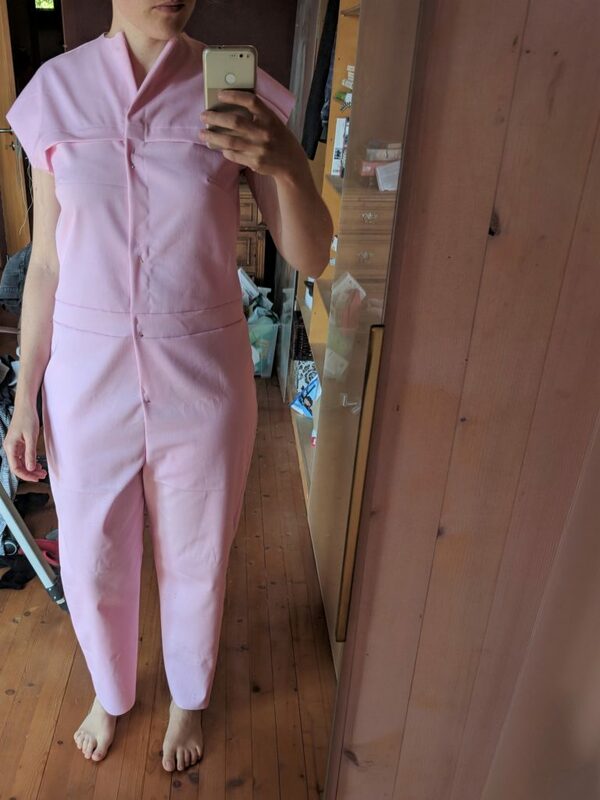 I think this fits like a boiler suit should, roomy enough to move around in it but with some feminine shaping. I’m still debating if I should slim down the legs slightly which would make them look a little bit more fashionable. Also the legs are a tad too short on me, especially since they are drafted to be rolled up. I might add some cuffs with leftover fabric to add some length. 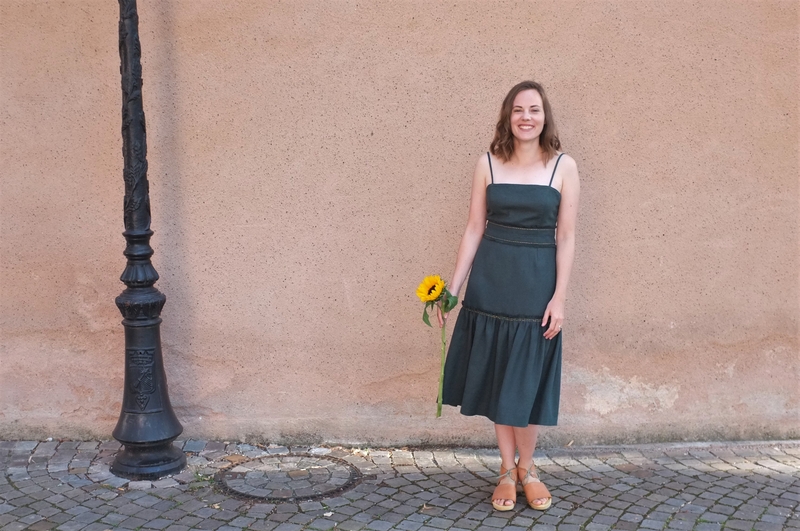 Raphaëlle did a great job with incorporating the tester feedback and the final version has a slightly shorter crotch as well as longer and slimmer legs. So most of the issues I had should not come up in the final pattern. So what is my verdict then? The Jean-Paul is a great pattern in terms of the detail of the instructions and the overall drafting. 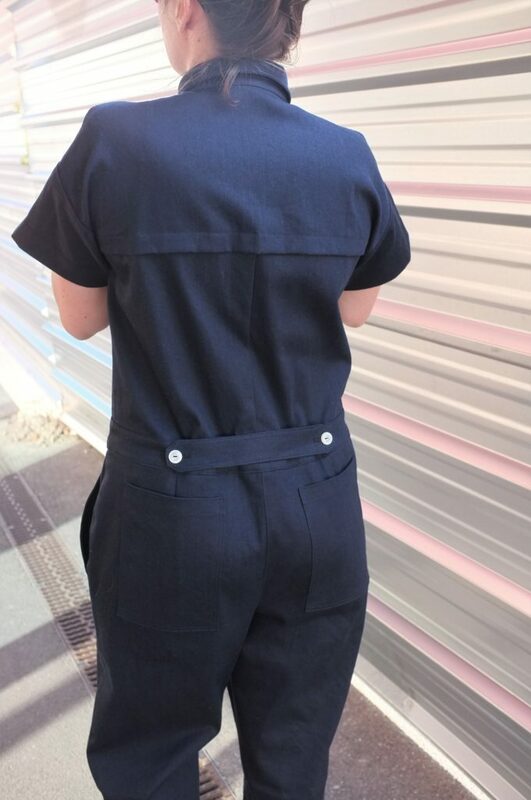 It’s and advanced sew, but it’s all so well described that with a little bit of patience you end up with a modern and professional looking boiler suit. 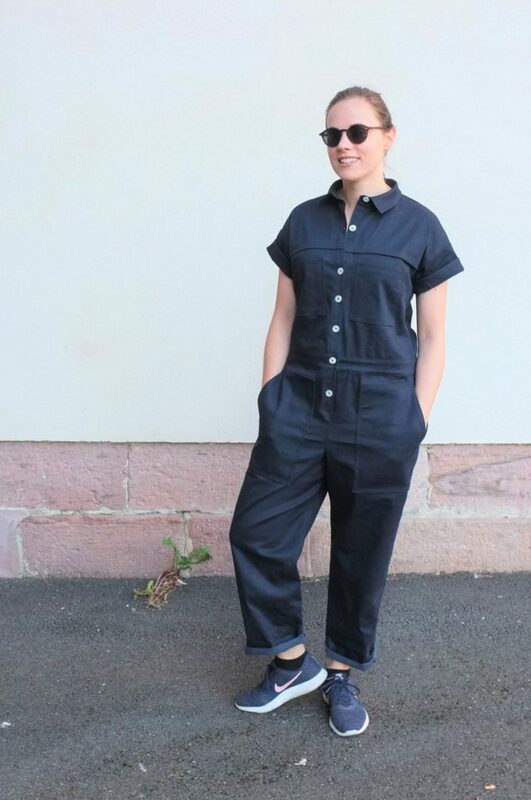 In my opinion a boiler suit in a heavy fabric like this works best in one of two scenarios, either as a very fashion forward piece (potentially in a bright colour) or in an atelier/workshop where it can actually be worn as a work outfit. 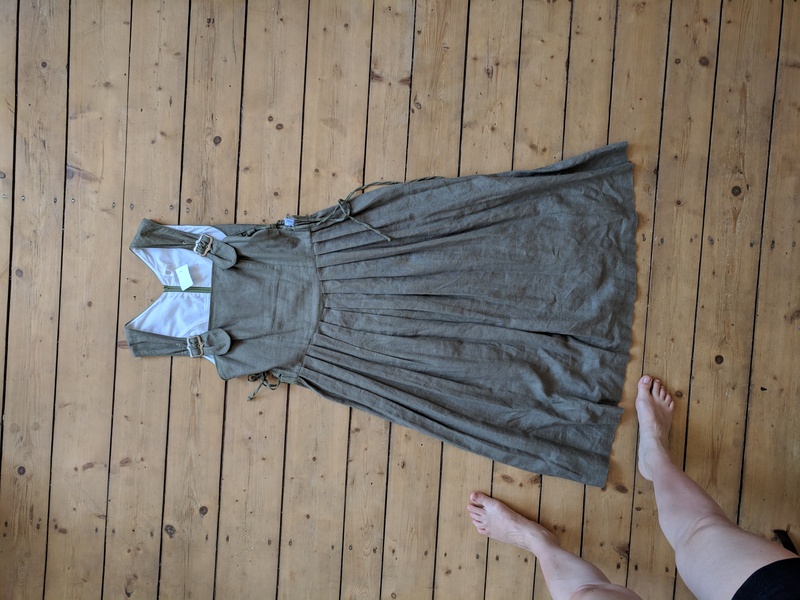 Since I don’t live in a big city with stylish people nor own my own studio (I wish), I struggle to find opportunities to wear this. 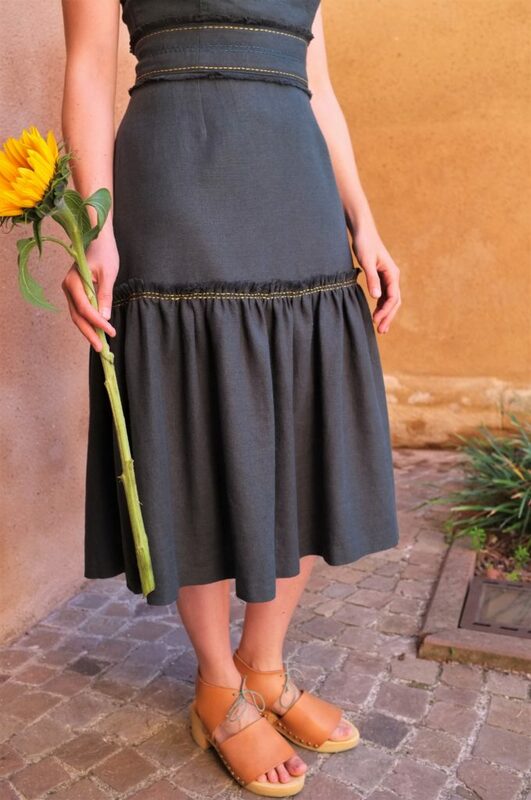 However, in a drapier fabric and maybe a fun colour I can see how this could work for daily wear. 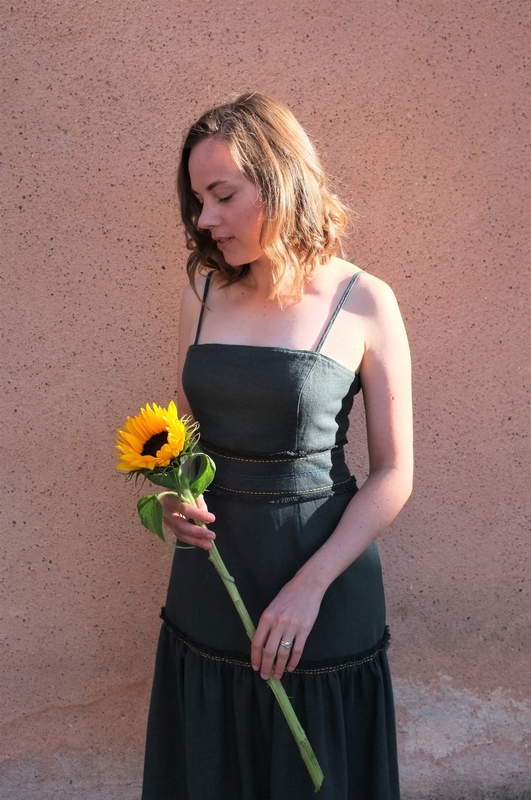 Make sure to check out the #JPReadyToSew hashtag, the other testers have made some amazing versions! I’m also intrigued to hack this into a shirt, maybe in some tencel twill. That pleat detail is just so much fun and I could use more work wear style tops.